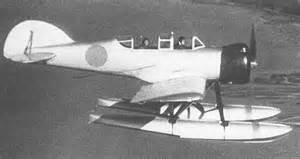 On Sept. 9, 1942, Fujita and his co-pilot, Okuda Shoji, had taken off from a submarine in their tiny Yokosuka E14Y seaplane at 6 a.m. The little seaplane was carrying an unusual cargo – two bombs. 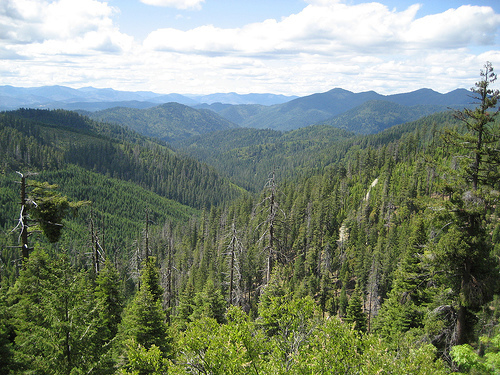 The target was as unusual as their cargo – Siskiyou National Forest near the town of Brookings, Oregon. Would someone seriously bomb a forest? Yes. The plan of the Japanese generals was to start a fire so huge that the armed forces of the U.S. government would have to be used to put it out, instead of fighting the war. Two Fire Service lookouts, Howard Gardner and Bob Larsen, were stationed on Mt. Emily that morning. They saw a strange sight – a seaplane! Something dropped from it, then the rangers saw smoke. They quickly reached the spot and put out the fire, helped by the fact that it had rained in the night. That was one bomb. What happened to the other bomb is still a mystery. Fujita made a second run 20 days later, dropping two more bombs, neither of which has ever been found. When he got home to Japan, Fujita was chosen to become a kamikaze pilot. He was one of about 15% of kamikaze pilots who survived. Brookings welcomed Fujita. 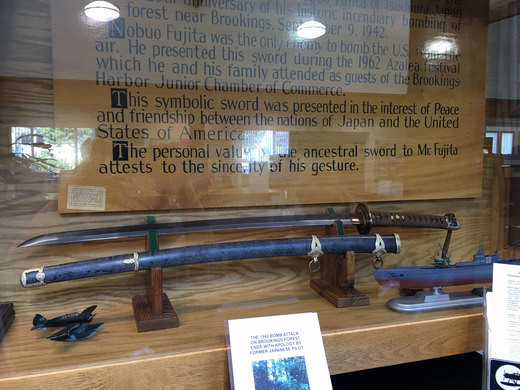 He gave them the precious gift – his family’s 400-year-old samurai sword. The town was so kind to Fujita that he sponsored three local students to visit Japan. In 1992, Fujita returned to Brookings and planted a tree at the bomb site. On Sept. 30, 1997, almost 55 years to the day after he had dropped his bombs, Nobuo Fujita was made an honorary citizen of Brookings, Oregon. He died a few days later. His daughter Yoriko took some of his ashes and buried them at the base of the tree he had planted. This is a remarkable story, in many ways! I love the human element. 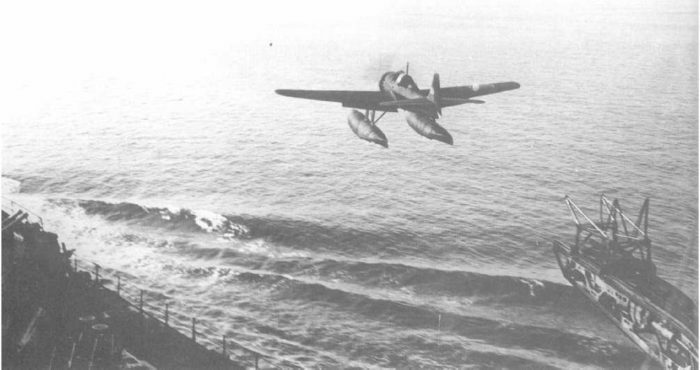 And I had no idea that a seaplane could be launched from a submarine, let alone in 1942 by the Japanese! Keep up the fascinating History Gossip! !